With the holidays coming up, many of us are inundated with various parties and other social events - I know I am. The best part of that for a makeup lover is obviously the opportunity to go a little more glam than day to day with makeup than we normally would. 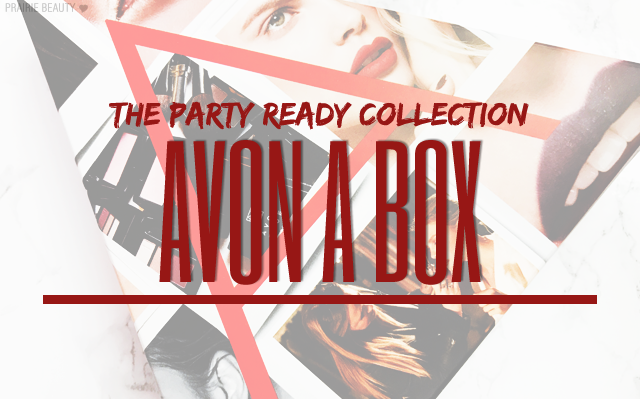 I think it was with this in mind that Avon released the Party Ready Collection A Box*, which is a collection of five products for prepping and creating a party look. To see what's inside the box, keep reading! As you can see, this is one of the more makeup heavy A Boxes, which I always enjoy personally. It's packaged in a box that is covered in makeup artistry photos. It actually contains what is probably my favorite product from Avon of all time - always a bonus! I haven't tried this mascara yet, so I can't speak to how well it works, but I'm always down to try a new mascara. The brush is a little bit bigger than I personally prefer, but the spacing of the bristles makes me feel like this could do a good job of volumizing and separating at the same time. I really enjoy this cleanser actually. I received it in a previous A Box and I think it does quite a good job of cleansing the skin without stripping, making it a really good cleanser for wintertime. THIS is my favorite product from Avon ever and probably my favorite eyeliner of all time to tightline with because it's been basically bulletproof for me. Black eyeliner can seem a little bit boring, but it's definitely a staple and this is a really, really good one. 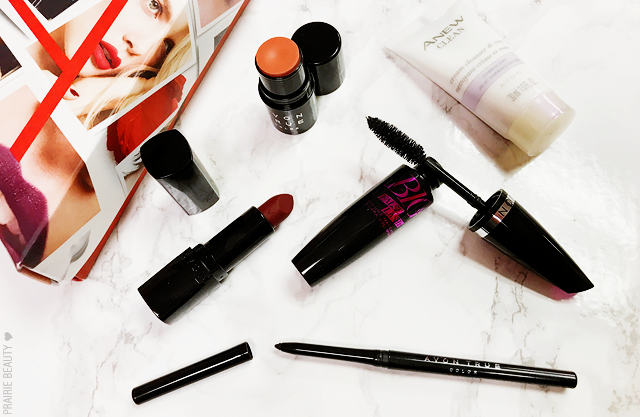 Who doesn't like a deep, vampy lip colour in a matte finish? I know I do. I haven't actually worn this, but the swatch looked like really good payoff in a smooth, creamy matte finish. This is actually another product from Avon that I really enjoy. I tend to reach for this on lighter makeup days, but it also works really well when you're doing dramatic eyes and lips and want a little bit of colour on the cheeks but don't want anything too bold or dramatic. Overall, I think this is a pretty well curated box for the theme. I think that the cleanser for prep paired with products for bold eyes and lips and neutral cheeks is really well planned. And honestly, the black eyeliner alone basically sells this box to me, though. The Avon Party Ready Collection A Box* is still available now for $10 with any $40 Avon purchase. Contact your local Avon representative for more info and to order.